Did ya hear the one about the guy who tried to make love to 400,000 people? Growing up in a family business was still to this day one of the best experiences of my life because not only did I learn way more about business at a very young age than most people I knew but I got to do it all next to my Dad. My Dad has always been a great teacher to me and most of who I am and how I work (drive, motivation and work ethic) were all passed on from him. No one enjoys any little success I have more than my Dad so it was extra special last week when I was featured in a pretty amazing article in INC Magazine (online version) called ALL YOU NEED IS LOVE because INC is not only MY favorite mag but also his! “Making love to customers is not a campaign, but a lifestyle,” says Saul in his talk. What does he mean? “Making love to your customers is not something that you can do for a certain amount of time–it is a company commitment. You can’t run this like an ad campaign–customers will sense when it is over and leave you. Over-exceeding expectations means treating your customers better than any other company relationship your customer has ever had.” This is something the Nordstrom executive or a manager at the Four Seasons would smile knowingly and nod at. Writing this post has gotten me all nostalgic and I only wish my Dad could see this…..I think he would enjoy this post. Oh What? No my Dad is very much still alive….he just doesn’t know how to use the internet! 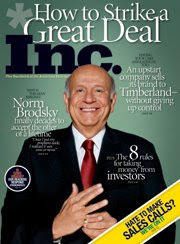 Saul, Congratulations on the incredible article in INC. Magazine – I’ve read it twice! If you could be cloned, we wouldn’t have customer service problems to complain about. I hope you’ll buy a copy of print version to share with your dad. Saul, Congrats on the INC article. Always great to read about fellow Canadian entrepreneurs being recognized for amazing work. Keep up the great work with Freshbook and continued success.